Intesa Communications Group, LLC, is a strategic communications and government relations firm, offering digitally- and politically-savvy reputation management and public affairs counsel to clients we believe in. You can surf around our website to learn more about our clients, accolades, and work approach. Our award-winning team provides local and national leaders with opportunity and crisis strategies that build public and private support for projects, enhance reputations, strengthen relationships, and leverage technology to provide stakeholders with the information they need to make informed decisions. We also have a cool office space and are open to new ways of doing things. You are an extraordinary writer with a minimum of 5 years of experience in public relations, media relations, and content creation. Your self-motivating work approach and ninja-like organizational skills allow you to exceed expectations in the workplace. The public relations and strategic communications fields genuinely interest you, and your professional track record and reputation are solid. You bring your best every day, and are inspired and driven by leaving clients and communities better than you found them. You are ethical, on time, and overall just plain fun to be around. 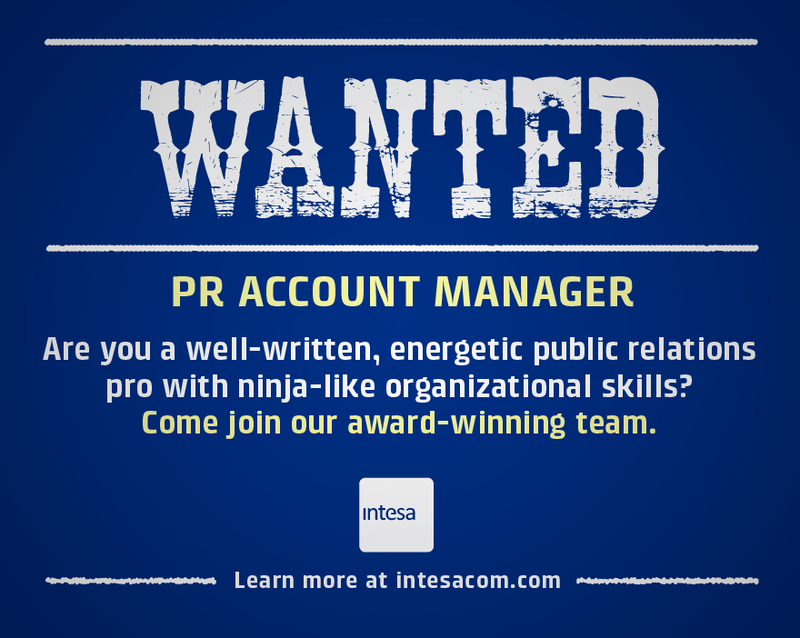 The Public Relations (PR) Account Manager reports to the Founding Partner and is responsible for managing and executing media relations and communications strategies and tactics in support of Intesa’s San Diego-based clients. The Account Manager will leverage existing media relationships and cultivate new contacts within the San Diego region, and nationally, as needed. She/he will monitor, analyze and communicate media hits, PR metrics, and of-interest local news. Our ideal candidate must be able to work independently, quickly adapt to situations and take initiative in a fast-paced environment. She/he must exercise discretion, judgment and tact while interacting with clients, elected officials, external executives, assistants, consultants, vendors and all levels of staff. The Intesa team enjoys a positive, active, fun, and professional work environment and is looking for an experienced Account Manager to contribute these same qualities. Experience with digital media including blogs, Facebook, Twitter, etc. If this describes and excites you or someone you know, email your resume and memorable cover letter to Margie@intesacom.com.